HyPe, SAC’s Hybrid Performance Program, supports the creation of innovative, contemporary hybrid performance in Tasmania by supporting artists to take conceptual leaps and to challenge the existing limitations of traditional performance making. Up to $10k to support experimentation, pushing the boundaries of your practice and experimenting with new ways of working. Are you an artist flirting with the idea of becoming a curator? We’ve got the opportunity for you! Constance ARI is partnering with Salamanca Arts Centre to give one early-career artist or artistic collaboration the opportunity to develop a multi-site curatorial project. The project will enable to selected artist to explore their own artistic endeavours through the creation of curatorial discussion between their own work and the work of others, enabling examination of their own practice in new ways. The project aims to develop the hybrid skill-set of the Artist-Curator, and to highlight the importance of this practice within artist-run initiatives. Applications that examine the model of curating as a means of expression and critical discussion will be highly regarded. For more details and to apply, see the application form HERE. During June, as part of Dark Mofo 2017, Salamanca Arts Centre will host a number of exciting new projects – including live music, installations and new text-based theatre. Outposts will feature installations by artists Peter Blamey, Eden Meure, Sally McIntyre, Pip Stafford and Brendan Walls/Robert Ashley. During the festival weekend evenings the Long Gallery will be taken over by The Last Bastion. This live performance, which is also curated by Brendan Walls, is described as a “sonic assault”. The line-up includes Matt Warren, Julia Drouhin, Dani Kirby, Edwina Stevens (Eves) and Jen Tait, SmashHits (Eden Meure, Bethany Sweatman and Tom Robb), Julius Schwing, Alf Jackson, Greg Kingston, Alethea Coombe, Michael Matherson Saunders, Lexie Lynch and Dangerous Game. Meanwhile the Peacock Theatre will host the debut of two new theatre works by Tasmanian sound-based theatre collective, Radio Gothic, featuring Heath Brown, Briony Kidd, Carrie McLean, Alison Mann, Jason James, Katie Robertson, and Craig Irons. The collective has been supported by the Australia Council through Salamanca Arts Centre’s HyPe (Hybrid Performance) Program to develop new Episodes during 2017. 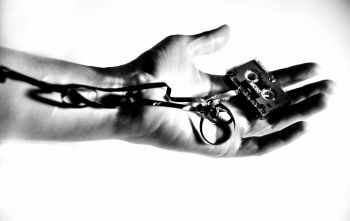 Presented by Dark Mofo from 7 – 11 June, Episode 2: The Hanniford Tapes, written by Carrie McLean, sees a psychiatrist obsessing over the murder committed by her client, as a woman’s voice consumes her mind. In Episode 3: The Illustrated Girl, written by Alison Mann, a woman wakes up to find a sinister tattoo on her hand. Presented as a double-bill, these stories are created by the collective using experimental live foley and sampling techniques to create a unique theatrical experience. Dark Mofo presented the first Radio Gothic project, Episode 1: The Pit, to acclaim during last year’s festival. Also in this year’s Dark Mofo, the Peacock Theatre will host the durational The Second Woman, a mesmerising 24-hour performance in which the artist invites one hundred men to star opposite her in a scene adapted from John Cassavetes’ American drama, Opening Night (1977). Top – Sally Ann McIntyre. Das Grosse Rauschen: The Metamorphosis of Radio (2016). SAC40 call out: What do you know about that giant octopus? 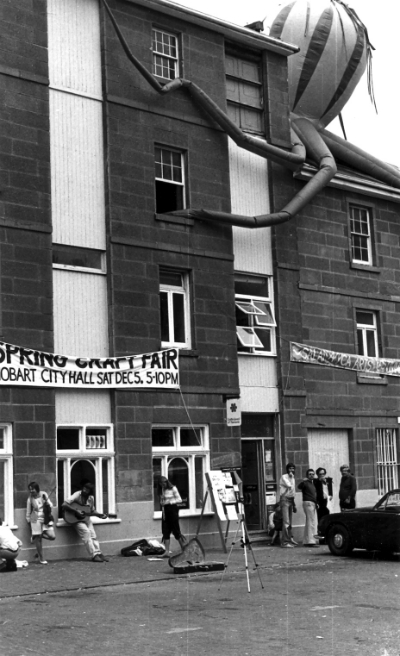 Do you know more about this giant octopus project in the 1980s? Get in touch. Strange and marvellous things have been happening at Salamanca Arts Centre for around four decades now. Whether it’s a giant octopus taking over, an Arts Ball to promote ‘socially responsible decadence’ or a protest at the market— these sandstone walls have seen it all! Attendees of the SAC Arts Ball in the 1990s. As a celebration of our 40th anniversary year in 2017 we want to share with the Tasmanian community the richness, exuberance and diversity of the precinct’s cultural history. We’re asking the public to share memorabilia and stories about what has made Salamanca Arts Centre (and the whole area) such a special and exciting place. Do you have a photo of going to a show in the Peacock when you were a kid? 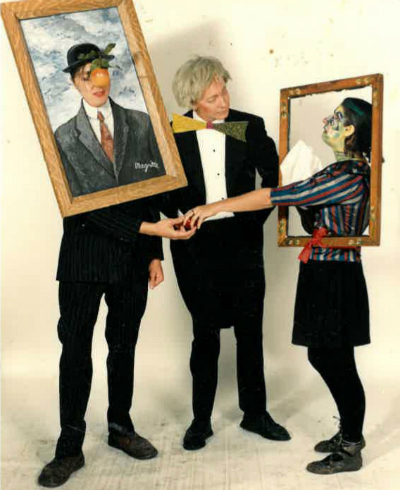 Did you dress up for one of the Arts Balls in the Long Gallery back in the day? Were you an artist creating, exhibiting or performing in the centre and publicising your work in an unusual way? Or maybe you were involved in some spontaneous political or artistic ‘happening’ that we can’t yet imagine or put into words! 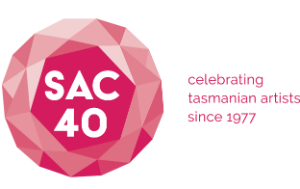 Whatever your SAC memorabilia entails, we invite you to share it with us… so that we can share it with Tasmania. Do you have old photos, slides, newspaper cuttings or similar? Items may be used in the programming of our 40th anniversary celebrations and/or to add to our archive. This project is about showcasing the tradition of vibrancy in Tasmania’s arts community, and your assistance is invaluable. Salamanca Arts Centre congratulates Tasmanian artists Dylan Sheridan and Sam Routledge on their Green Room Award, announced this week. Their work, Crush, has been recognised for Sound Performance in the Contemporary and Experimental Performance category. It was presented at Arts House as part of last year’s Festival of Live Arts (FOLA). “We really enjoyed making this work and it was fantastic to be able to present it in Melbourne at Arts House on the back of the Junction Arts Festival Season, which was supported by the Salamanca Arts Centre,” says Sam Routledge. “It’s always good to be recognised by your peers, and to receive this Green Room award from a panel of Melbourne-based artists, who see so much good work, feels really special”. 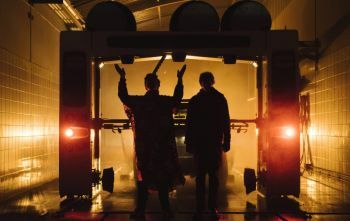 Crush is an immersive live artwork for auto car washes that explores new notions of slavery and servitude in a robot age. Audiences experience this work from inside a vehicle as it is being cleaned. Evoking the drive-in cinema, audiences tune into the soundtrack via the FM radio in their vehicle as it is transmitted live on site. As the large automated robot goes about its work, Sheridan’s score syncs to its movements, in a powerful and beautiful examination of vulnerability and power. The development of Crush was supported by Salamanca Arts Centre’s HyPe (Hybrid Performance) Program in 2015-16. HyPe supports the creation of innovative, contemporary hybrid performance by supporting Tasmanian artists to take conceptual leaps and to challenge the existing limitations of traditional performance and theatre. Composer and artist Dylan Sheridan is supported by HyPe in 2017 and will show a new work at Salamanca Arts Centre later in the year. The Green Room Awards were established in 1982 and are regarded as Melbourne’s premier peer-presented, performing arts industry awards. Crush was originally co-commissioned and produced by Junction Arts Festival and Salamanca Arts Centre through Like HyPe in 2015. In 2016 it was presented by the City of Melbourne through Arts House at the Festival of Life Arts (FOLA). FIND Contemporary Jewellery Collective at Salamanca Arts Centre are advising of an exciting new opportunity. This is an 8-week opportunity for emerging local jewellers to display and sell their work in a commercial environment; rent free. Any emerging jeweller who is based in Tasmania and is not currently showing or selling their work in other shops or galleries. (This excludes student exhibitions and markets). The successful applicant will get a high exposure, rent-free space in a well-established business for a set period of 8 weeks, display props included. There is no cost to apply and there is no rent charged. A small commission of 5% is taken on each sale. What is in it for FIND? FIND is a collective of 10 jewellers and know how difficult it can be to become established in this field. 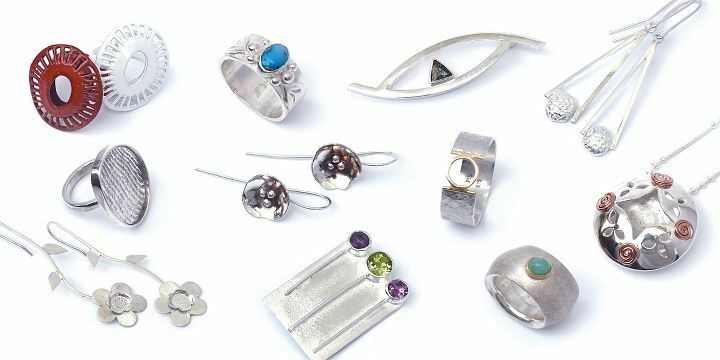 The space allocated for an emerging jeweller is FIND’s way of supporting the local arts community. To apply and for more information go to the listing on FIND’s website. 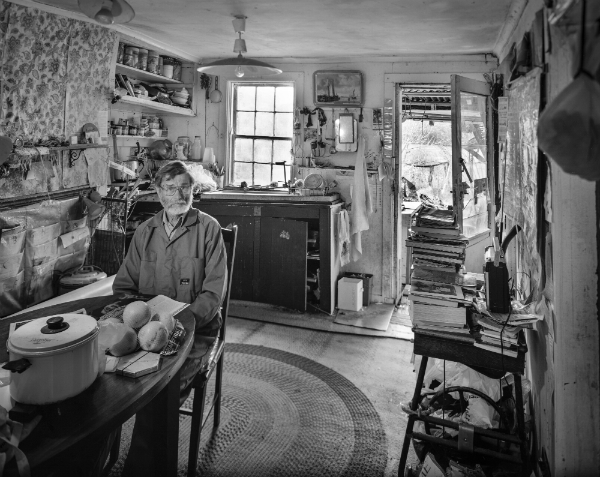 As part of Ten Days on the Island Salamanca Arts Centre is proud to present Proof of Life: Studio Sessions, which is curated by Elizabeth Woods and Kevin Leong as part of The Homesickness Project. The Homesickness Project’s thesis is that the role of the world as a home for its citizens is under threat and that collectively, we are increasingly homesick. Artists, experts, community groups and the general public will participate in a series of events that elaborate on and investigate possible answers to these questions: What does it mean to be civilised within an increasingly market-driven system of social values? What is required from our environment for us to thrive? The ensuing discussions, lectures, performances, demonstrations and exhibitions will invite public contribution and form the basis of a major exhibition opening in the Long Gallery in September 2017. This is an opportunity to observe and participate in the creative development of collaborative, socially-engaged art works. Featured artists include: Lisa Garland, Paul Gazzola, Laura Purcell, Elizabeth Woods, Kevin Leong, Abdul Hakim Hashemi Hamidi, Dalibor Martinis, Daphne Keramidas, James Newitt, Nick Leitch, Peta Cook, Leigh Hobba, and Hussen Ibraheem and Ameen Nayfeh. The official launch of the project is this Saturday, 18 March in the Long Gallery, Salamanca Arts Centre at 12 noon. This will be followed by a Curator’s Talk and an afternoon discussion forum entitled “Are We Really Alive?”. 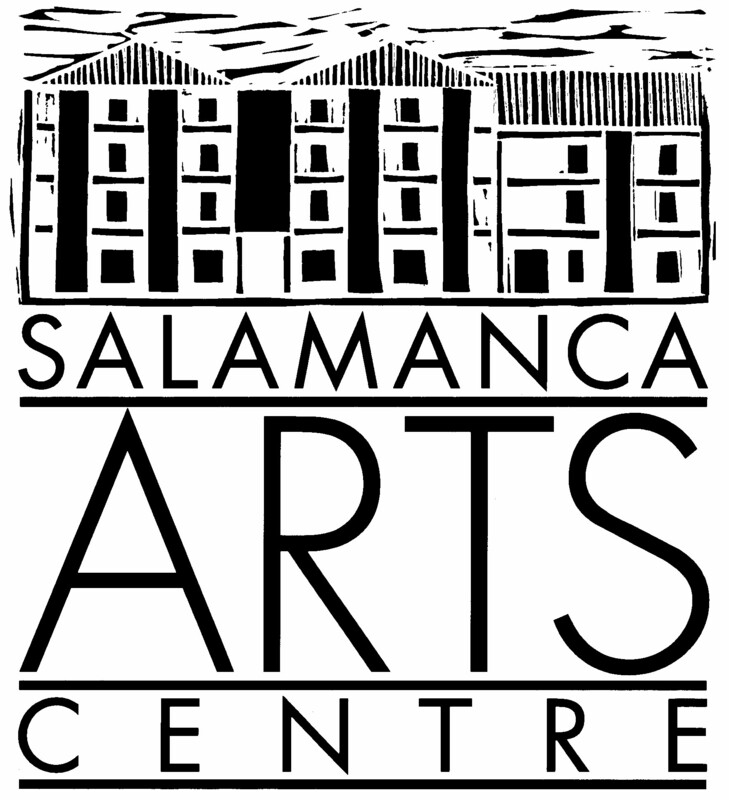 Salamanca Arts Centre is seeking to appoint an Executive Producer of interdisciplinary arts projects, programs and arts laboratories for the delivery of SITUATE Art in Festivals. Your EoI should address each of the Selection Criteria listed below, contain your CV (with relevant links), and include three to five referees. This is a fixed term part-time services contract, which will commence in March 2017 and conclude in December 2018 but with an option to renew the contract for a further 18 months. be passionate about experimental arts (in a variety of art forms including interdisciplinary) and helping early career artists to achieve their potential.have direct experience of working in a variety of arts festivals. have direct experience with the processes required to commission, develop and present/install works in festivals and/or public art programs. have solid experience with experimental artists’ Professional Development programs, and a demonstrable ability to organise, produce and deliver an intensive Professional Developmental Arts Lab (of around two weeks’ duration). have excellent national networks across the contemporary arts sector. have relevant administration experience, well-developed budget and project management skills, winning grant-writing experience and effective communications and team-building skills. be experienced in social media and website management and proficient with a range of relevant programs. have educational qualifications in the arts. have considerable experience in working with/for an arts organisation. have experience with funding agencies and stakeholder communications and reporting. If you have experience in the key areas, as described, and are looking to take on this exciting and challenging role, you are invited to contact Joe Bugden. To obtain further information about this project. You will be asked to submit a formal Expression of Interest by email to ceo@sac.org.au by Tuesday 7 March 2017..